What is the difference between a simple home facial treatment, from a professional clean-up session? Simple, the best at-home facial steamer. What is the purpose of the steamer? A facial steamer softens your skin and opens up your pores, allowing skin care products to penetrate deep into your skin, all while cleaning off dust, dead skin cells, and other impurities from the surface. How can you select the best product for steaming? And do you need one in the first place? 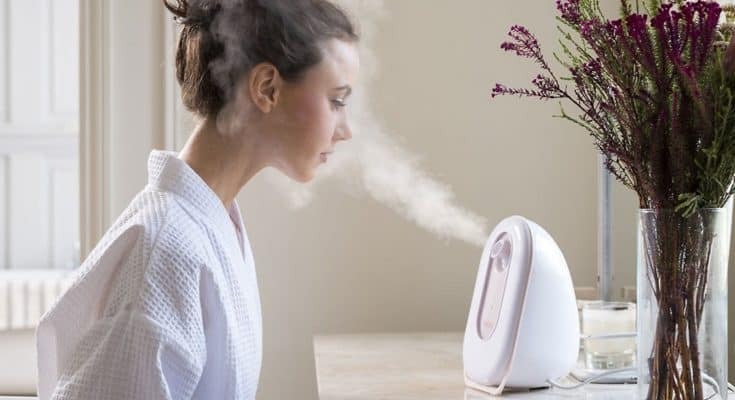 We have all of the answers, including benefits of steaming, how to use a facial steamer professionally, and how to select the best one. 2 What essential oils to add? 5 What to look for in a best facial steamer? If you’ve ever been to a professional skin care treatment, you know there is a part some of us hate, and some of us love. That part is the steaming. You are put under steam, which can be irritating for some people, but it is just part of the process. And you know your face feels softer afterward. Well, that is just one benefit of using a steamer. With that in mind, here is a quick breakdown of all the benefits of steaming. What essential oils to add? As mentioned previously, you can make the steaming treatment that much more enjoyable if you add some herbs and essential oils. Using oils will make the treatment more effective and efficient as well. We know essential oils can help in skin care treatment, so here is a quick breakdown of some of the more popular and useful oils. Some people prefer to add essential oils to their steaming treatment, others go for herbs. 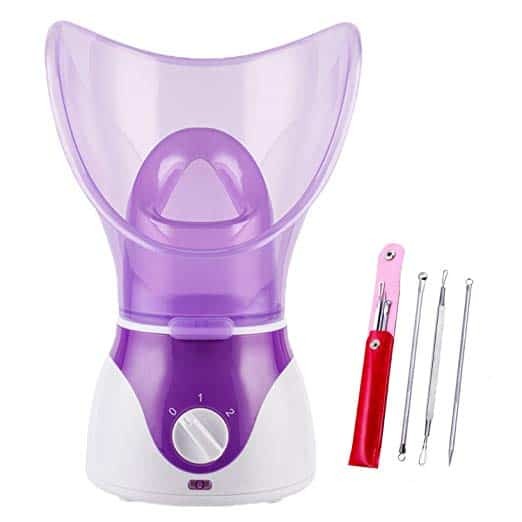 Even if you buy the best facial steamer, you want to use it properly. We want to give you some tips on how to maximize and utilize your steamer in the best possible way. What to look for in a best facial steamer? Each steamer has its own distinctive set of features. There are no two steamers alike. However, there are some features you want to make sure your device has. It might be difficult to find a steamer that ticks all of the boxes. But you can tick most of them. 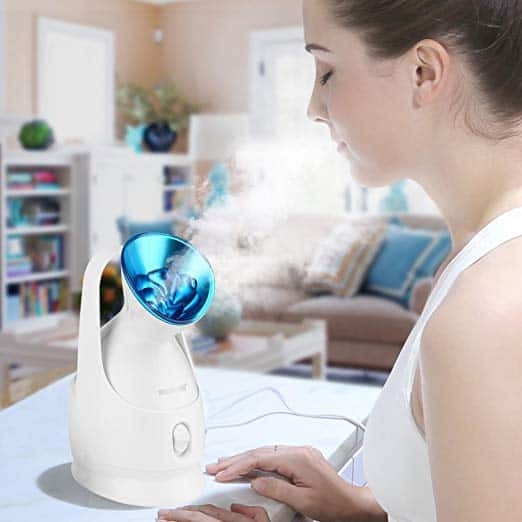 If you want an aromatherapy treatment, always go for a humidifier designed for aromatherapy. Consider where you will use the steamer. Will you be able to adjust the direction of the outlet nozzle? Is your steamer adaptable? If you want the best quality of your steamer, go for one that produces nano steam, which is much finer than regular steam. Nano steam can penetrate the skin even deeper than regular steam. For some people, peace and quiet are important as well. That is why you should look for a steamer that emits no noise when it is working. When it comes to safety features, arguably the most important one is “automatically shut off”. This feature can shut off when the water runs low. Without it, the water can boil dry, cause damage to the steamer, and potentially harm to you and your skin. You definitely do not want to stand up and check the level of water in the steamer while enjoying the treatment. This is America’s best-selling facial steamer. And there is a reason why it is a best-selling product. For starters, this steamer uses nano-ionic steam, which is 10 times more effective than regular steam. One of the big benefits is it has a dedicated chamber for warming towels if you want to try a towel steaming treatment. 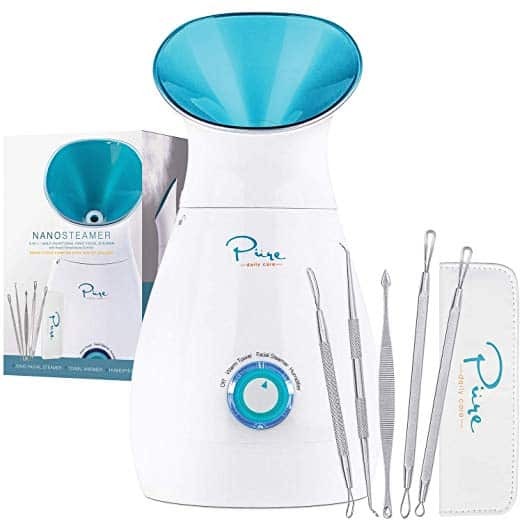 You get a 3 in 1 unit, cup to pour water, power cord, and stainless-steel blackhead and blemish extractor kit when buying the product. You get everything you need for a home spa face steaming experience. The device is powerful enough to function as a room humidifier as well. Other useful features include intuitive controls, large water tank, towel warming chamber, silent operation, and more. Most importantly, it is extremely easy to use. The stylish top part is what makes this steamer a joy to have. Not many facial steamers can also double up as decorative devices in your home. This one, can. The steamer will look good while steaming your face. 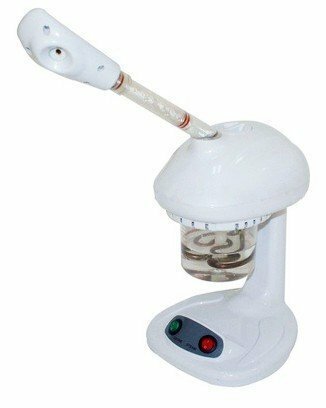 With a PTC ceramic heating element, the steamer is able to produce steam almost instantly. Just press the button, and steam comes out of it. Water particles are extremely moisturizing and absorbent. In addition to the steamer, you also get a blackhead removal kit. The water tank can contain 70ml of water, good enough for 12 minutes of continuous use. 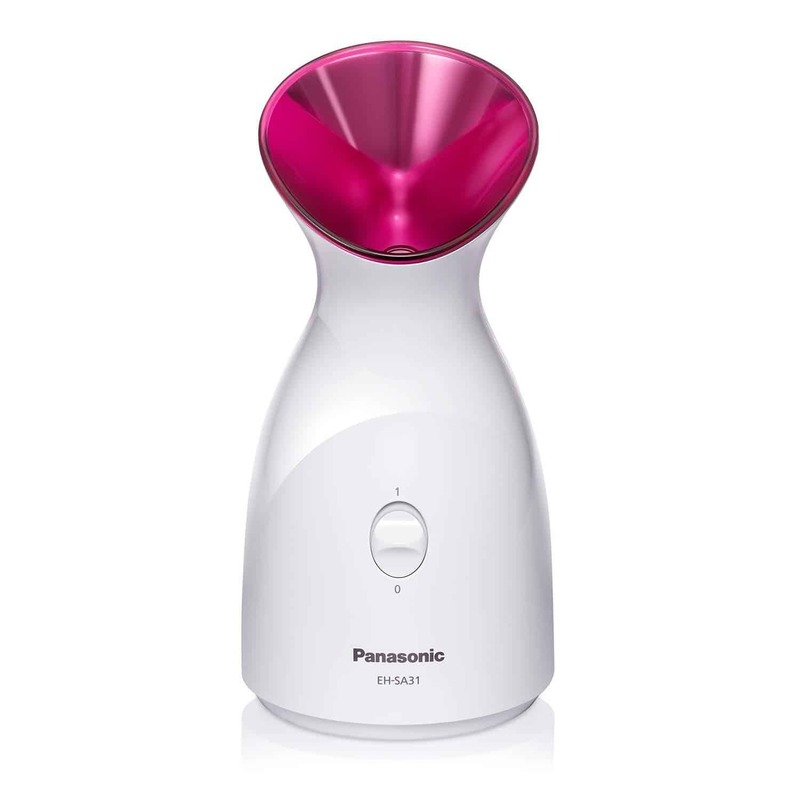 The Panasonic Facial steamer lets you enjoy a spa-like treatment at your home. Do you want to go to a sauna? Now you have one at the convenience of your home. 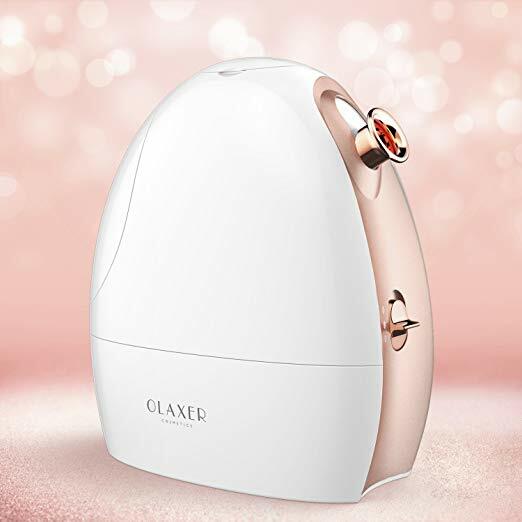 The steamer will soothe your skin with nano-sized steam particles, and then provide deep-cleansing and moisture for your skin. Great for daily skin care regimen, as you can easily use it in the mornings before going out of the home. Who doesn’t want to leave home with glowing skin? The sleek and stylish design allows you to use this steamer anywhere you like. 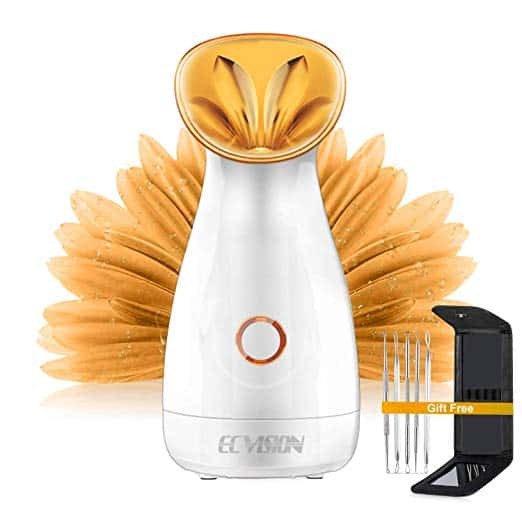 If you are looking for a luxurious facial steamer, either for you or as a gift, this product will do just fine. If you enjoy aromatherapy, even better. 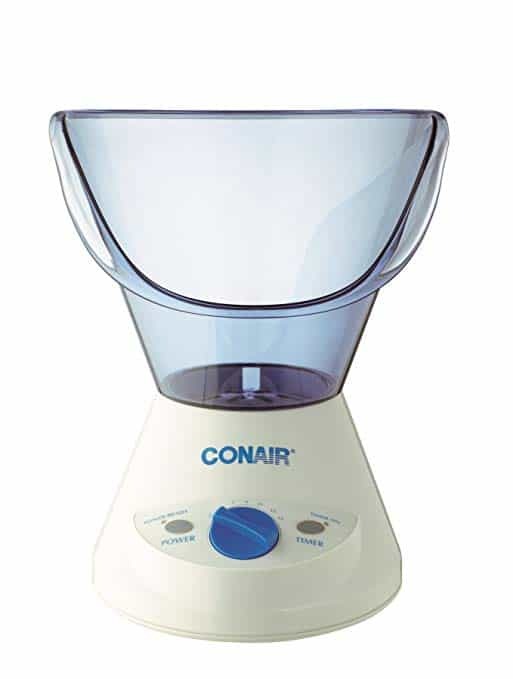 One of the unique features of this facial steamer is that you get to adjust the temperature. You can choose between a short hot steam session or a long steam session. And no matter which one you choose, there is an automatic turn off setting. You can easily fill up the larger tank and comes with an adjustable nozzle to direct the steam exactly where you want it. 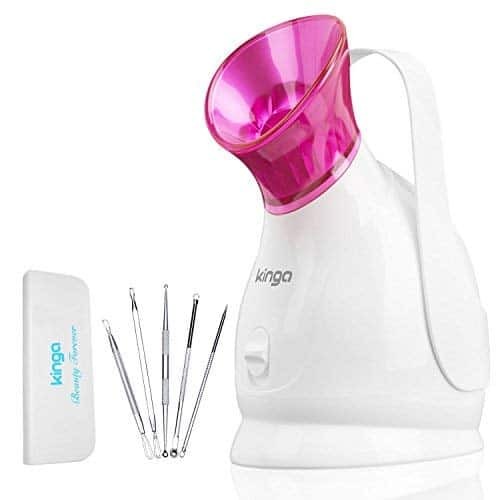 The device also comes with an aromatherapy basket that sits at the top of the steamer, allowing you to add fruits or essential oils to the treatment. The tank is one of the biggest you can find on the market at 180ml. The design is not something that will make you crave for this steamer. However, the quality is there. 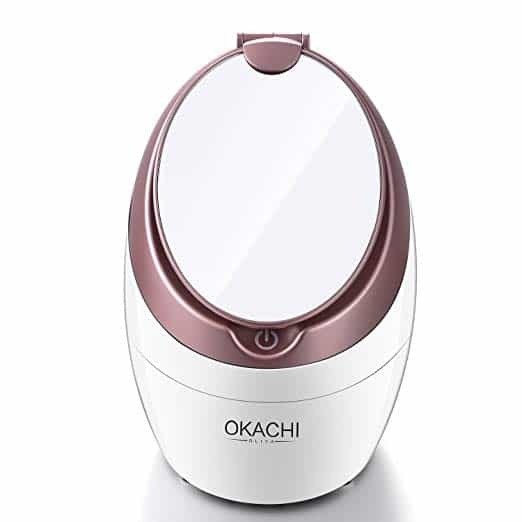 What makes it special, however, is that it comes with an additional facial cleansing brush. You can use the brush to dust off any dirt, oil, and other impurities of your face. After that, your face can easily absorb the steam. Another big benefit is that it comes with a nasal cone, which allows you to steam your sinuses if you have sinus issues. The adjustable timer allows you to precisely set the period during which you want steam to come at your face. You can adjust it between 3 and 15 minutes. The automatic shut off option kicks at 45 minutes. The Kingdom cares facial steamer provides a home sauna spa system thanks to nano ionic hot mist face sprayer. Designed to help you moisturize your skin, but also provide professional salon sauna spa at home. Use it to unclog pores, and prepare your skin for skin care products. The device can double up as a humidifier in your room. Thanks to the high-tech ozone function, the steamer can also sterilize the steam so that you receive the purest form of it. Fast charging and starting function enables you to get steam in less than 30 seconds. The device looks like an exotic sea sponge. If you appreciate great design, and you want every device in your home to be stylish and fashionable, this steamer is right for you. You can even choose between different color patterns. With a mighty heating element, the steamer can produce steam in less than 30 seconds. As with some other steamers on this list, it comes with a UV light sterilization. Combining the most advanced nanotechnology and UV treatment, the device delivers a pure and consistent flow of steam. Portable, and professional, the device will look good in your home. Most importantly, it is BPA-free. The intelligent steaming balance system enables the steamer to release consistent steam at a temperature of 104 F (40C). The tank holds up to 80ml of water and comes with upgraded safety features. Comes with an automatic shut off option. Last, but not list, you can use the double-sided cosmetic mirror to help you extract blockages from your pores. The steamer might be small, but that makes it convenient for use in your bathroom. Steam-spewing prowess can is measured in two levels, and a zero, so you can make an adjustment and have control over how much steam you want. The top part comes in two versions, for general steaming, and one for facials. One of the unique features of the steamer is the handy measuring cup that can save you time. When you look at the price, you might be surprised how a small steamer can cost two times than a large one. Well, it is all about the convenience you get. This tiny steamer is personalized and you can use basically anytime, anywhere. The ozone option gives you an instant refreshment and makes your skin look refreshed and glowing. Comes with an auto-off feature. Coconut Oil for Tanning: Is it Good or Bad? How to Use it?